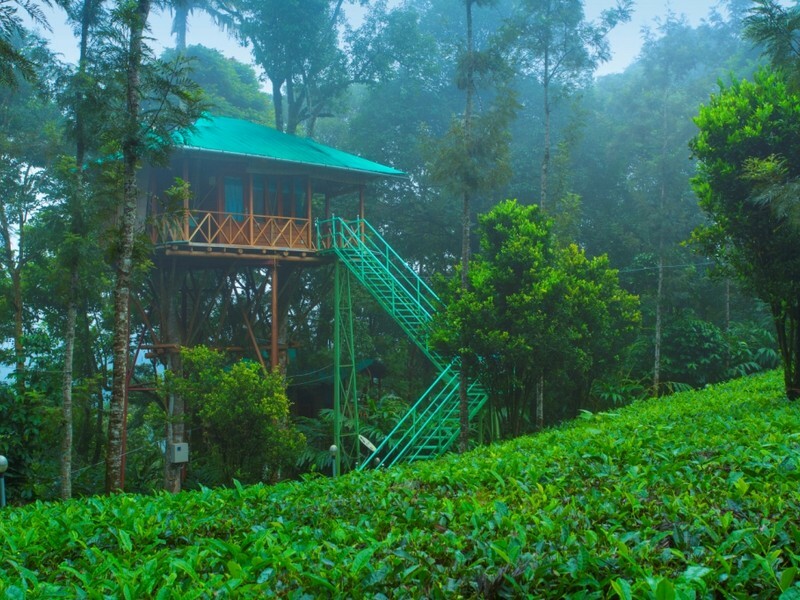 The Jungle Jive tree house in Munnar is the perfect retreat into nature. People visit Munnar to experience the majesty of the mountains, the chill of the hills, the jingle of the jungle, the babbling rivers, the enchanting plantations, and to break free from the monotony of a humdrum life. 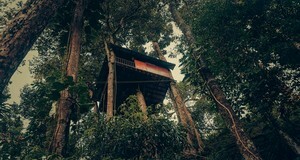 A stay in a tree house allows you to enjoy all these experience up close. The Jungle Jive property is encircled by plantations of cardamom, pepper, coffee and tea and the borders of the estate is encrusted by thick, unperturbed forest and wildlife. The aggregation of giant trees lined around the tree house paralyzes pollution and worldly noises from entering the premises. Once you start the ascent towards the tree houses, the cacophony of civilization recedes and you will be welcomed with the bounties of nature. Once you mount the balcony of the tree house, a magical scene unfurls before you. The swarm of birds flying across the trees, the horde of squirrels running up and down the canopy, the chants of crickets and beetles from the bushes and the gentle breeze caressing your face will make want to stay there forever. The place is equally enjoyable in the darkness of the night; the fireflies flying around in the background of a starry night will transcend you to a magical place. The aroma of spices arising from the plantation is a treat for the senses and your soul. A sojourn here is essentially a trip to the lap of nature. The eco-friendly construction of the property will make your stay more enjoyable than the concrete walls of a hotel room. The place is ideal for families, honeymooners, adventurists, friends, lone travelers and even for the elderly. The stay here will make you love and appreciate nature more. The land of majestic hills is abundant with trekking spots. We arrange trekking expeditions to almost all the prominent trekking locations of Munnar. Scaling the heights of impregnable mountains is a thrilling experience and we make sure that our guests get a taste of adventure with our trekking packages. Our trekking packages are safe and comfortable and they are backed by prime safety measures and excellent medical assistance. Jeep safaris ensure that a visitor sees every nook and cranny of this beautiful hill station. A jeep safari covers the entire place of Munnar, taking visitors to blooming gardens, enchanting tea plantations, scenic waterfalls, picturesque grasslands, charming spice gardens, to the foothills of mist clad mountains and much more. The lakes and dams of Munnar are prolific with fishes and other aquatic animals. Jungle Jive takes the visitors for fishing to nearby dams. The equipment for fishing and safety requirements are provided to the guests. The fishing squad will include guides who will teach the guests how to use the equipment and to fish from dams. Boat navigation in the breathtaking lakes of the place is spellbinding. Jungle Jive offers speed boating and pedal boating services at Chengulam Dam. The boating services are backed by quality equipment and experienced professionals. The boating in serene waters of the dam is ensured to enrich the holiday experience at Jungle Jive. The jungle jive property is an ideal location for star gazing. The 15-acre property gives you ample space to gaze at the starry sky. To see the stars and the silhouette of mountains and the moonlight valleys is an ethereal experience. A holiday experience is incomplete without the fun of campfire and barbeque. At Jungle Jive one can experience an exciting campfire and enjoy delectable barbeque dishes under the starry sky. This will give the guests a good opportunity to socialize and enjoy some good food. The plantations in Munnar are alluring and one cannot resist the desire to walk in these mesmerizing gardens. Tours are organized by Jungle Jive to plantations of pepper, cardamom, ginger, tea, coffee, and banana. The guests are allowed to explore the plantations as much as they want, they are briefed about the farming techniques and are allowed to buy fresh spices right from the plantations. 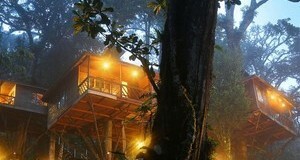 Jungle Jive tree house is located at Devagiri in Munnar. The property is situated at a distance of 15 kilometers from Munnar town. The nearest airport to the location is Cochin International Airport which is 110 kilometers away and takes 3 hours and 10 minutes to reach. The nearest railway stations to the location are Aluva railway station and Ernakulam railway station which are 108 kilometers and 130 kilometers away respectively. If you are traveling to Munnar in private vehicles you can reach the location from Munnar town in less than an hour. If you are reaching Munnar in public transport you will have to hire a jeep or any other public transport to reach the tree house. The nearest landmarks to the location are Chengulam Dam at a distance of 3 kilometers and Dreamland Fun Park at a distance of 2 kilometers from the property.